Marilyn Gore and Sujith Nambiar, Ahmedabad: The link between flowers and emotions has been around forever, and it even led to the birth of the language of flowers in Victorian England. The Victorians saw red roses as passionate, and linked the number 12 with the months of the years, so a dozen red roses came to mean love all around the year—a good gift for Valentine’s Day. A dozen red roses might still be the ultimate expression of love in the West, but local florists have noticed that flowers are falling out of favour as the perfect Valentine’s Day gift. Akash Rami of Rami Brothers at Commerce Six Roads says that in the past, he’s catered to clients who would buy 100 roses for their valentine, but those days are long gone. Nehal Samant, who runs Tulip Flora at Mansi Circle in Vastrapur, says, “The demand for flowers in general has declined steadily over the past few years, so we’ve stocked up on heart-shaped stuffed toys as well. So far, the response has been quite lukewarm, but we expect it to pick up by the end of business.” Wedding decorators form Tulip Flora’s primary clientele these days. While changing preferences have certainly played a role in this shift, the “seasonal” hike in prices is also a factor. Retailers claim that supply costs increase around this time of year due to the wedding season. “The cost of supply has risen over the years due to several factors such as smaller yields from farms and orchards. So, a single rose which used to be available for something as cheap as Rs5 has to be now sold at Rs20 each,” says Rajubhai of Super Florist at the wholesale market at Jamalpur. While this may be true, the extreme price mark-ups by retailers themselves could be coming into play. For instance, one gerbera retails for Rs15–20 on Valentine’s Day and Rs10–15 on “normal” days. We bought a bunch of 10 for Rs40 from the wholesale market on Wednesday morning. Similarly, we found a single red rose retailing at up to Rs30 at some florists, when a bunch of 20 cost between Rs100 and Rs200 in the Jamalpur market on Wednesday morning. Retailers admit that this is about 50% higher than their regular costs. Chocolates are always a good option, and lovebirds in the city have picked up on the trend. This year, popular florists like Rami Brothers have stocked international brands to accompany a bouquet. At the same time, there are caveats. “I don’t want a slab of ‘everyday’ chocolate for Valentine’s Day. It has to be special,” New Delhi-based author Suprita Das told us. A 33-year-old creative writer and blogger from Ahmedabad, who asked not to be named, enumerated “cheesy heart-shaped gifts including cakes, balloons and soft toys” as her nightmare presents. “I would rather get something that shows that my man has put in some thought and effort into something that relates to me. It could be a technology-free day for just the two of us, where maybe we could spend the day reliving past dates. Or he could get me the fancy stand-mixer I’ve been eyeing for my baking.” she said. Akash Rami of Rami Brothers said that “useful” gifts also seem to be gaining popularity, which ties in neatly with our blogger’s request for a stand-mixer. "Just make sure you match your gift to your Valentine"
Advertising executive Anurag Chatterjee agrees with the idea of personalized gifts. “I would hate to receive a DVD of La La Land, for instance,” he said. 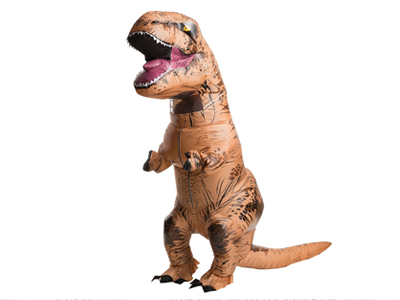 His idea of the perfect gift: a wearable T-Rex suit. A short survey brought in some more interesting ideas. Some “good” gifts included: “a book I’ve wanted to read”, “a movie date”, “vouchers for free coffee”, “gender equality” and “peace of mind”. “Bad” ones included: “personal grooming products”, “lingerie”, the very vague “things I’m not interested in”, “video games” and “a greeting card, especially one that’s blank except for a signature”. And some ideas were truly bizarre: “Nycil powder”, “used underwear, especially without washing”, “medicine for venereal disease”; and there were those were blithely politically incorrect: “Poland, but perhaps that’s too much to ask this close to winter” and “a one-way ticket to North Korea”. Even we’re not sure if they actually wanted these last few ones, or not.